Ford Motor Co. is offering hefty discounts of more than $10,000 on leasing its Focus electric vehicle. The Dearborn automaker also said on its website that it has dropped the base price of the Focus EV by $2,000 for cash sales and is offering up to $10,750 off for three-year-leases. 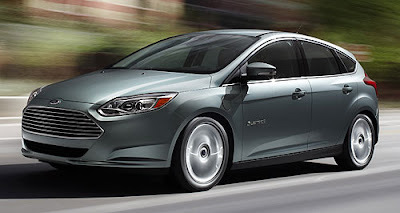 Ford is also offering a $2,000 cash discount on the Focus EV and 1.9 percent financing if purchased through Ford Motor Credit. The automaker sold just 685 Focus EVs in 2012, while it built 1,627 Focus EVs — making it one of the poorest performers among electric vehicles on the market. Last week, Nissan Motor Co. dropped the price of its new 2013 Leaf EV by 18 percent to $28,800 and last year offered incentives in the wake of far lower than expected sales. Ford's new discounts came just days after the announcement. "We certainly are not in a situation where we have to completely discount but we do have to respond to competitive pressures," Ford spokesman Wes Sherwood said. "We're not anywhere close where Nissan has gone with the Leaf." The Leaf's sold about the same number as in 2011. Last year, Nissan sold 9,819 Leaf EVs in the U.S. — up 1.5 percent over 2011. Last week, Nissan CEO Carlos Ghosn called the Leaf sales "a disappointment for us." Ford's website says it is offering $10,750 off "Red Carpet leases," if taking retail delivery by April 1. The incentive program started last week. Ford says not all Focus EVs will qualify. The lease includes the value of a $7,500 federal tax credit. Ford says a customer could get a 36-month lease with 10,500 miles a year for $285 a month and $930 due at signing. Sherwood said Ford was offering the Focus EV for around $350 a month on lease last year. Last year, the base price of the Focus EV was $39,995. Ford's website now lists the base price as $37,995 for "cash-only" sales. Ford is also offering long-term financing — $500 a month over 72 percent at 1.9 percent interest with a 10 percent down payment. The incentives are similar to what General Motors Co. was offering last year on its plug-in hybrid Chevrolet Volt, when it offered about $10,000 discounts on Volt leases - a figure that also included the $7,500 tax credit. GM tripled Volt sales in 2012 to more than 23,000. Ford executive chairman Bill Ford Jr. said he couldn't predict when Focus EV sales might increase. "It's the right bet to make — trying to guess timing is always difficult, because there are so many variables," Ford said. "This is a long journey. Anytime you introduce new technology and particularly powertrain technology it's a long ramp-up." Ford said the company is meeting true demand that customers want "so we're not stuck playing the game of having to either incentivize or close factories." The Focus EV, Leaf and Chevrolet Volt all qualify for a $7,500 federal tax credit and some states offer $2,500 tax credits which when added to the Ford lease incentive could see a total of over $20,000 discounted, more than halving the cost of the Focus EV.